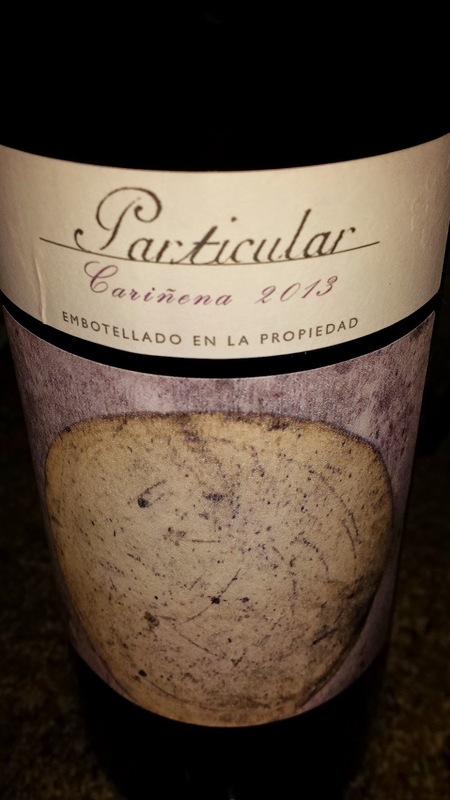 The final week of the #WineStudio focus on Cariñena Garnacha centered on two wines from Bodegas Paniza. This winery was founded in 1953 and is named for the village where the winery is located. It is situated in the highest elevation area of D.O.P. Cariñena to the south, in the Sistema Ibérico mountain range. This elevation brings cools the grapes after they've basked in the sun during the day. The area also provides diverse soils from limestone, sand, and clay stone which allows for a diversity in grape varieties planted. The winery co-op consists of 400 growers tending 6,200 acres of vineyards. 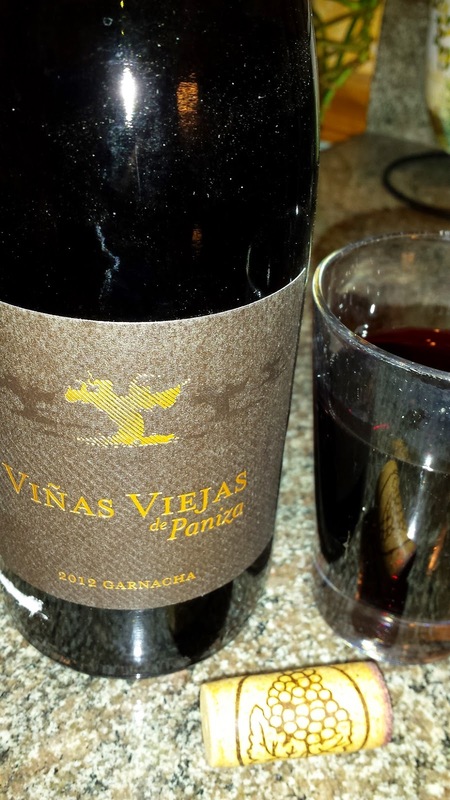 We started with the 2012 Viñas Viejas de Paniza Garnacha ($18, 14.5%), 100% Garnacha that has been aged 6 months in American and French oak. This wine started with loads of sour cherry, in both the nose and palette, some chocolate notes, and fresh acids on the tail. As it opened, a chewy leather texture developed - adding depth. 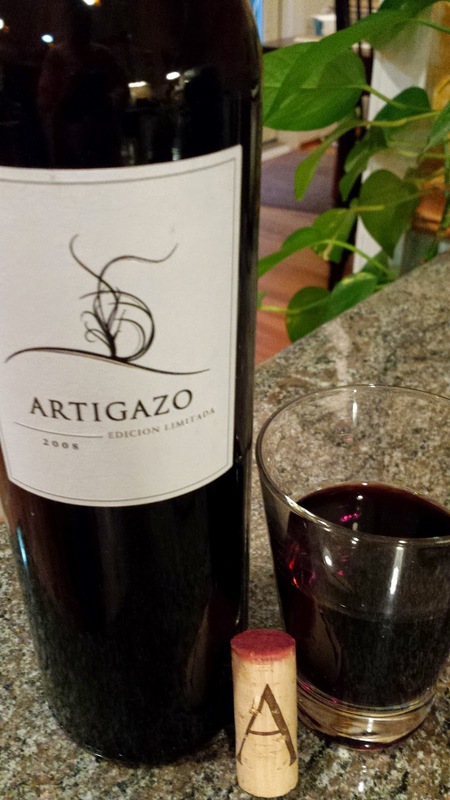 This nice wine was followed by the 2008 Paniza Artigazo ($27, 14.5%), a blend of 40% Garnacha, 30% Syrah, and 30% Cabernet Sauvignon. The grapes were hand harvested from 40 year old vines. After the initial fermentation, the malolatic fermentation occurred in new French oak. The wine is then decanted, aged another 18 months in barrel, then a further 18 months in the bottle before release. The result is a muted sour cherry aroma, with a spicy, deeply gummy or tar palette, finishing with a decent mouthfeel. A good wine, but for the price, prefer others. Cheers. 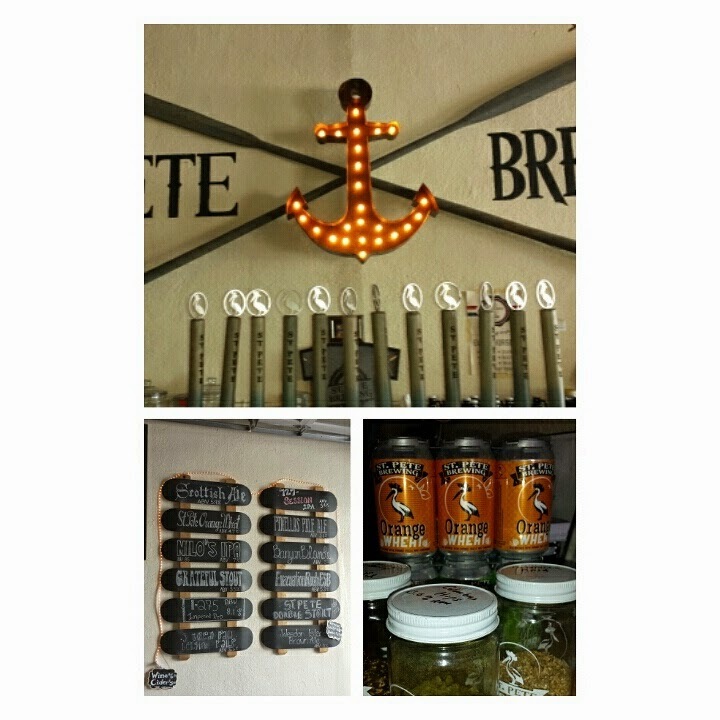 This Sunday we continued the #VABreweryChallenge with a visit to the Gainesville area and Old Bust Head Brewing Company and the Tin Cannon Brewing Co.. 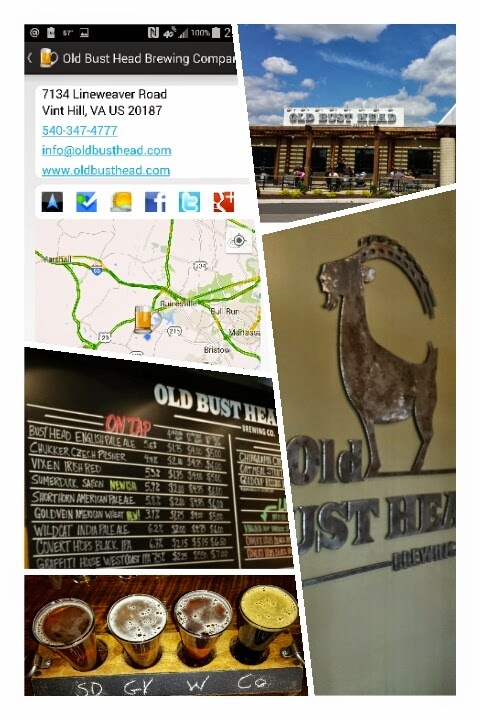 I was introduce to Old Bust Head through Jammin Java, where their Chukker Pilsner and Bust Head English Pale Ale are served. The brewery is located adjacent toVint Hill Craft Winery, thus a wine-beer pairing is mandatory; as is a visit to the nearby Cold War Museum. The brewery was founded by Ike and Julie Broaddus and Charles Kling, who converted a former military contractor’s warehouse. They planned big, adding capacity to soon reach 40,000 barrels of beer annually with implemented their plan to distribute widely in the Mid-Atlantic. Master brewer Kling received industry training at Abita Brewing Company and the Diamond Bear Brewing Company to augment his Chemical Engineering degree. The tasting room is spacious; the beers solid, mainly traditional styles. Graffiti House (7.5%) - West coast styled IPA. Powerful citrus aroma and finishes very clean. Bust Head English Pale Ale (5.6%) -Flavorful pale pale, decent bite at finish. Wildcat IPA (6.7%) - Hoppy aromas, without the painful over-hopped finish. Very nice. Chukker Pilsner (4.4%) - Bready, caramel, with steely hop finish. Goldvein American Wheat (3.9%) -Where's the wheat? But enjoy nevertheless. Sumerduck Saison (5.9%) - Solid Saison, spices evident but not overwhelming. Gold Cup Russian Imperial Stout (10%) - Favorite beer; big, malty with chocolate tones and a little bite at the tail. Chinquapin Chestnut Porter (5.1%) -Subtle mocha and nuts, solid offering. Breakfast of Champions (6.5%) - Amber ale brewed with chipotle peppers and bacon. The flavor profile oscillates between the two. Very drinkable. Gilligan's Island Ginger (5.8%) - Pale ale infused with mild ginger spice from ginger root. A taste of Bermuda. 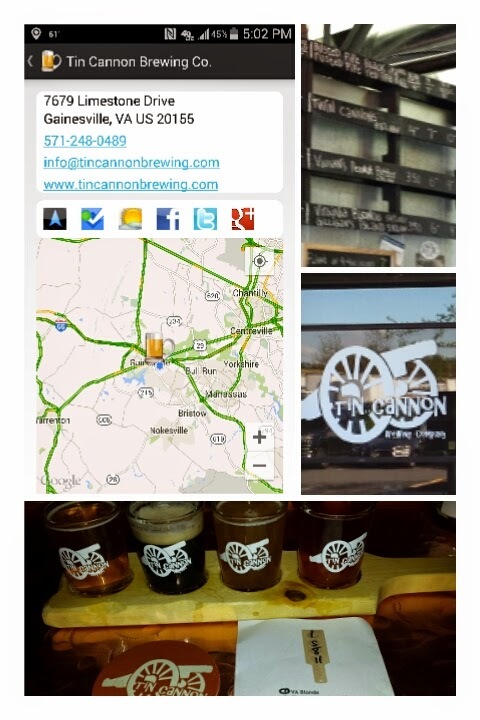 Tin Cannon Double IPA (8.8%) - High IBU (84) but meshes with excess malt to blend seamlessly. Virginia Blonde Ale (5.0%) - Easy drinking ale with flavor. Vaughn's Peanut Butter Porter (7.0%) - Not at all sweet like the Sweet Baby Jesus and the PB lingers long with the finish. Also served with vanilla ice cream. This Tuesday is the final chapter in Protocol Wine Studio's focus on Cariñena Garnacha - Grenache to most of us. D.O.P. Cariñena is a Spanish wine region located in the northeast, bordering the Pyrenees and France to the north and Catalunya to the east. Monks have been making wine in the area since the 1400s, but the region was not granted D.O.P. status until1932. The region is elevated, with most vineyards located in the 1,800 - 2,000 foot range. That along with a strong diurnal shift and rocky soils provide an ideal environment for Garnacha. In fact, the region was not affected by the 1860s Phylloxera blight because of these sandy soils. A majority of grape growers have formed co-ops, so that the three largest produce a majority of Cariñena Garnacha and all utilize "old vine" with vineyards 50-100 years old. The Cariñena grape (Carignan) is also prevalent; but Garnacha is the dominant grape and there are more old vine Garnacha in Cariñenathan anywhere else in Spain. The first week of tasting featured two wines from Grandes Vinos y Viñedos, the youngest co-op of the big three - founded in 1997. 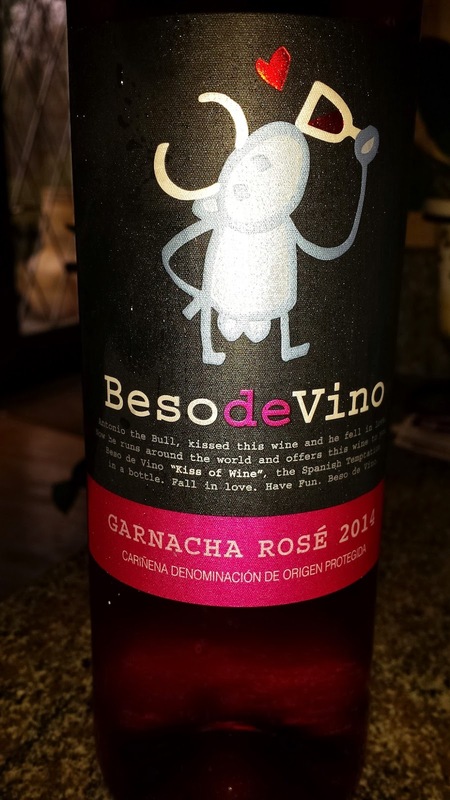 It sources fruit from each of the region's 14 growing areas and winemaker Marcello Morales uses these to create a Provence-styled rose, the Grandes Vinos y Viñedos, 2014 Beso de Vino Garnacha Rosé ($10, 13% ABV). After an eight hour cold soak, this free run juice was fermented at low temperatures That's an amazing price for non-saignée rosé and after tasting, a true bargain. This is a bright wine, big red cherry aroma followed by minerals and ending with great acidity. Here's your summer sipper. 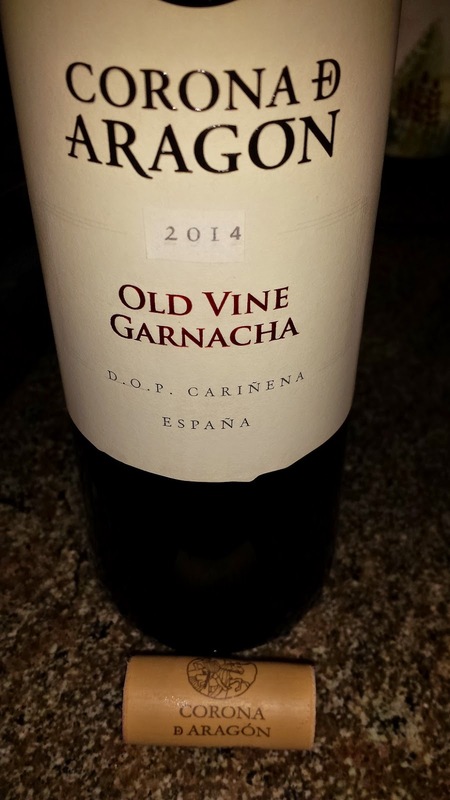 We then moved on to another great value, the Grandes Vinos y Viñedos, 2014 Corona de Aragón Old Vine Garnacha ($10, 13.5% ABV). The grapes were sourced from the oldest vines in the Villanueva de Huerva region - the highest and most remote in Cariñen. After fermentation, the wine was aged just four months in oak providing a fruity and jammy wine with subtle texture, dusty tannins, and a surprising long finish. Quite nice. The second week of tasting featured wines from Bodegas San Valero (Grupo BSV), the oldest winery in Cariñena - founded in 1944. The winery manages 700 grape growers and 8,600 acres of land, focusing on low yield plots. 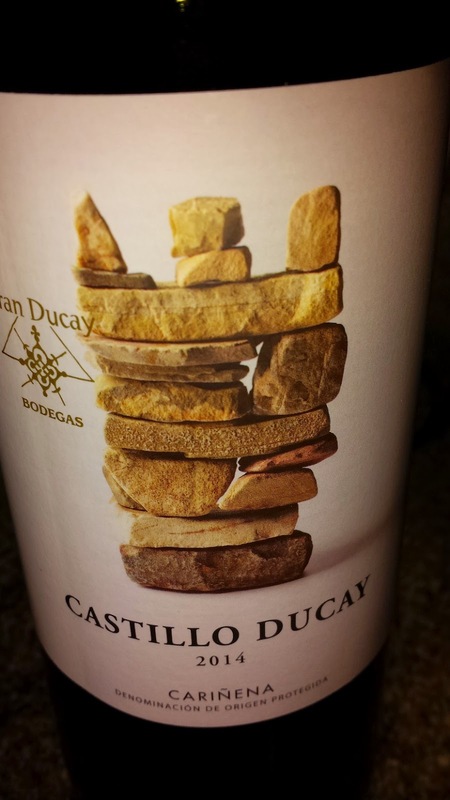 I started with the Bodegas San Valero, Castillo Ducay Tinto Joven ($8-10, 13% ABV), where the grapes are sourced from the Monte Ducay vineyard. This plot is located at 2,100 feet and includes15 to 20 year-old vines. The final produce is another value wine that exudes concentrated cherry juice that mellows with decanting. There's a chewy chocolate texture to the wine which finishes gently. Drink now, perhaps a little BBQ. The second wine was the Bodegas San Valero, 2013 Particular Cariñena ($15), a more complex and luscious wine with a leathery, herbal, and dark cherry aroma, silky velvety mid, and soft tannins. So far this is my favorite of the Cariñena session and another bargain. At 9PM Tuesday April 28th, #WineStudio will finish the series with two wines from Bodegas Paniza. 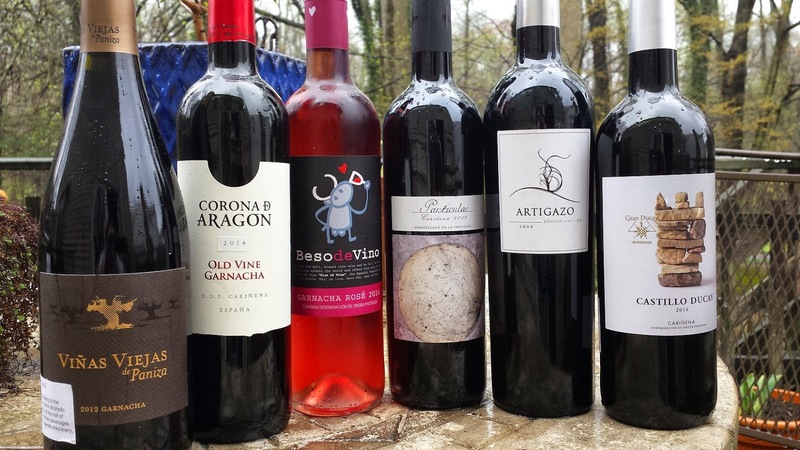 Come join the Cariñena Garnacha discussion. Cheers. Before a Washington Nationals game this week, I hit Metro early in order to visit Bluejacket Brewery - located just two blocks north of the stadium. 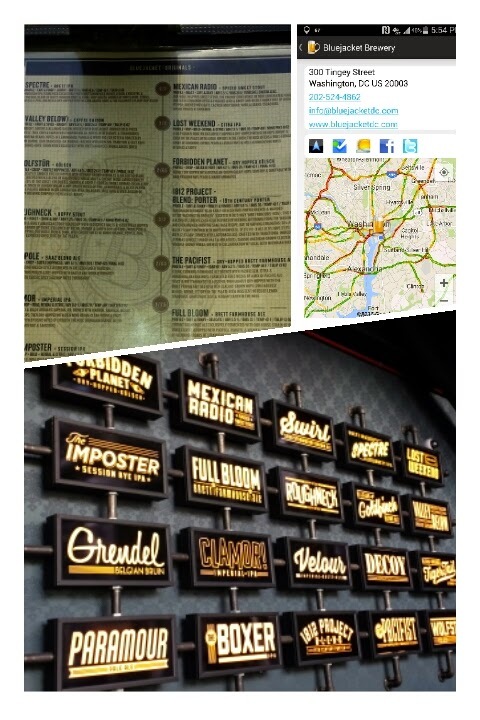 The brewery has a vast and varied beer selection (at least 20 beers), ranging from Kolsch to Stout. I asked for something on the tart or sour side and the bartender recommended two styles of Farmhouse Ales or the 1812 Project - Blend Porter. Now, you normally don't associate this style with tartness, but the 1812 Project is quite unique. Under the direction of Beer Director and Sommelier Greg Engert's direction, Bluejacket is resurrecting historical beer recipes that were once brewed in the District. According to Mary Beth Albright, breweries were once the 2nd largest employer in Washington DC after the Federal Government and one of the very first breweries was Washington Brewery. Thus Bluejacket decided to produce three of their former beers: Table Ale, Strong Ale, and X Ale. Without the actual recipes they improvised. So although Engert and his project collaborator Michael Stein didn’t have beer recipes, they set out to find the best ingredients to produce flavor profiles matching the pleasantly sour and complex beers of two centuries ago, when brewing methods allowed in more naturally-occurring bacteria. They located the oldest American-grown hop varietal, cluster hops, and their amber malt, used frequently in period brewing, came from 200-year-old maltster Thomas Fawcett. Since the Washington Brewery advertised itself as a "Beer and Porter" brewery, the team blended the three beers as was the Porter style 200 years ago. The result is a masterpiece and nothing like modern day Porters. It's tart with a funky cherry depth that finishes with chocolate. The Table Ale and X Ale provide the tartness, fruit, and funk with the Strong Ale attributing the color, more funk, and chocolate. This is a limited release, so hurry up to a Nats game and enjoy from historic ales. Cheers. Update:I've updated the post based on clarifications from Mike Stein. My son's 10th birthday and Spring Break coincided with a trip to Florida with the stipulation that I can visit a brewery where ever we ventured. 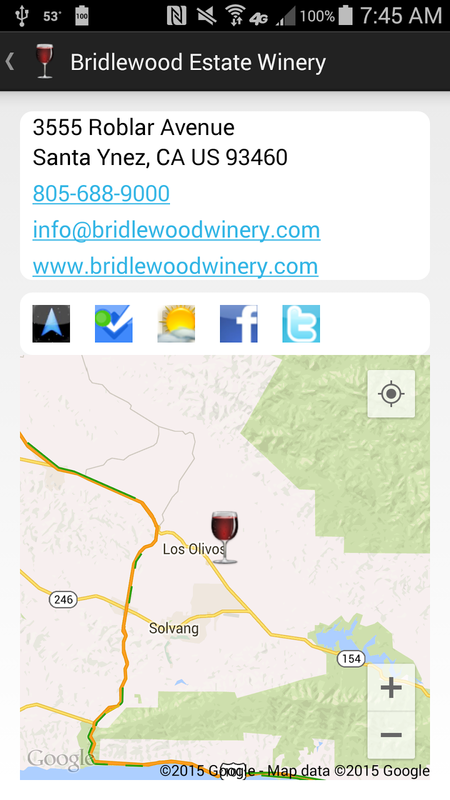 And the theCompass Winery Brewery Distillery app was the perfect accoutrement to locating these breweries. 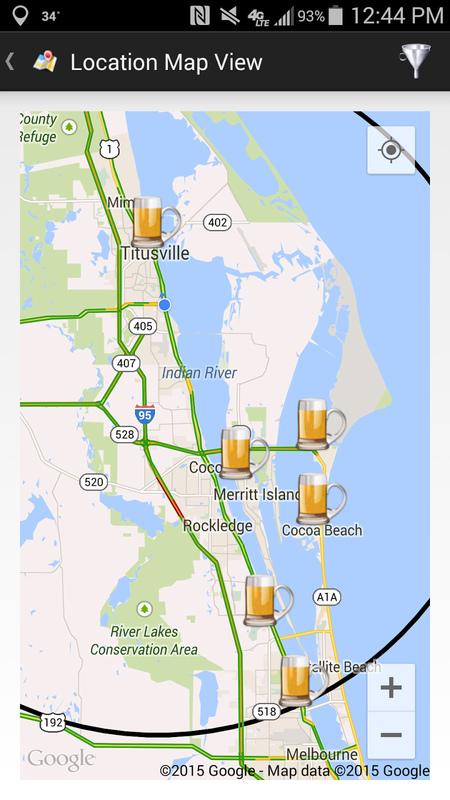 We started on the right coast visiting relatives near Cape Canaveral which hosts half a dozen breweries. 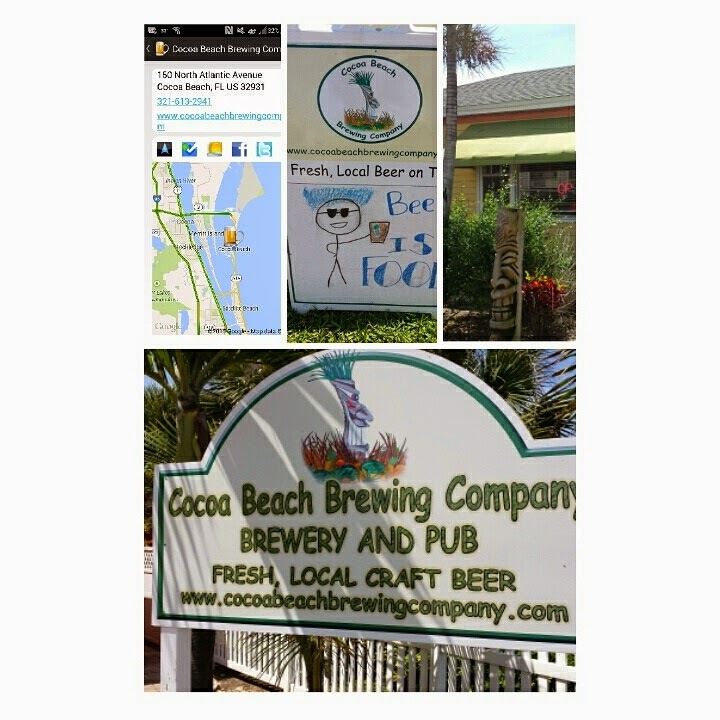 Our first stop was the beach and the Cocoa Beach Brewing Company, a nano with two beers on tap, the Cocoa Beach Pale Ale and Honey Golden Belgian, The later was quite tasty and brewed with 60 pounds of local honey. 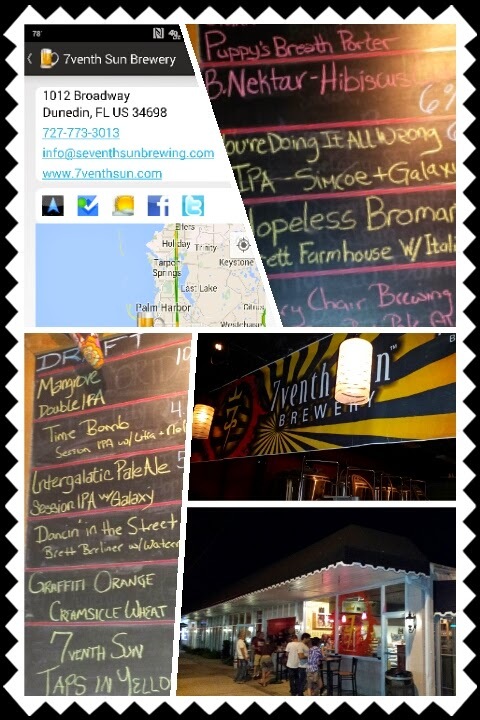 The next day we ventured a little north to Titusville and I forced a stop at Playalinda Brewing Company. This newbie has a great selection, many reflective of its environment. The Bottomless Blonde Ale was light and refreshing; the Shear Bliss Ruby Red Grapefruit also refreshing with a citrus and floral character. They also produce a honey Saison, the Honey Bee Belgian, which is just as tasty as the one at Cocoa Beach. The most interesting beer was the Mezzcal Margarita Ale, brewed with fresh lime juice, smoked peppers & agave nectar. The agave is evident but blends nicely into the smoked lemon flavors. And yes, they brew a sour - the Sour Puss German-style Berliner Weiss. You know that was on my sampler list; quite good. We then drove to the Suncoast with our first stop, Ybor City (actually the Florida Aquarium) and the Tampa Bay Brewing Company. This was my second trip to the brewpub and they only disappointment was I couldn't show my son an operating canning line. No canning that day, but excellent wheat beer in the Wild Warthog HefeWeizen. Yeasty banana in fact. The brewery is best known for Old Elephant Foot IPA™ and Reef Donkey APA - solid beers canned to go. 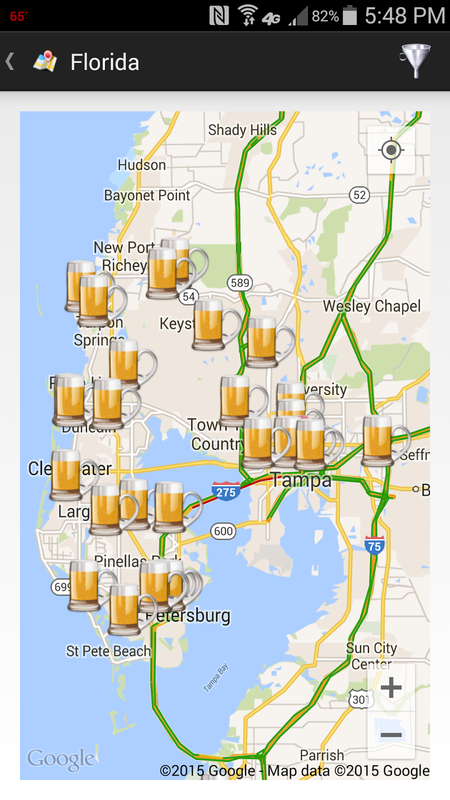 I was determined to visit Cigar City Brewing, I mean how can one visit Tampa and not include this beer icon? Fortunately the brewery is centrally located near the airport and with a couple hours available before picking up our travel companions, a side trip was made. 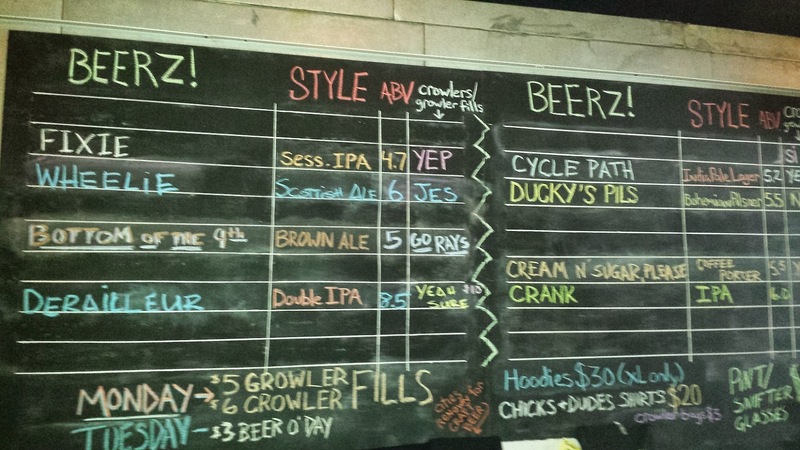 The beer selection is overwhelming, maybe 20 beers on tap - some collaborations, some guests, the rest, brewed in house. I was captivated by the Josh's Little Lady Friend Belgian-Style Singel and the English Dark Mild With Cherries, Vanilla, & Coffee. The first was light, bready and funky; whereas the second had loads of flavor, with the cherries exuding forth as the beer warms. With a driver and more time, I could have stayed all day. 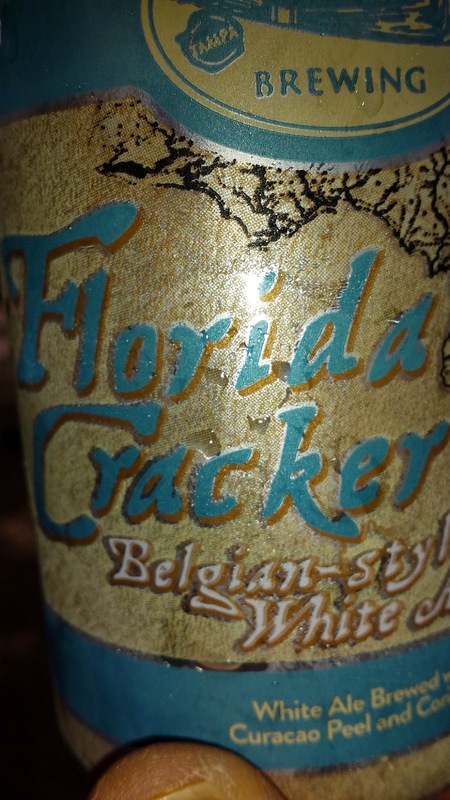 Fortunately I found the Cigar City Florida Cracker Belgian-style White Ale at Busch Gardens later in the week. 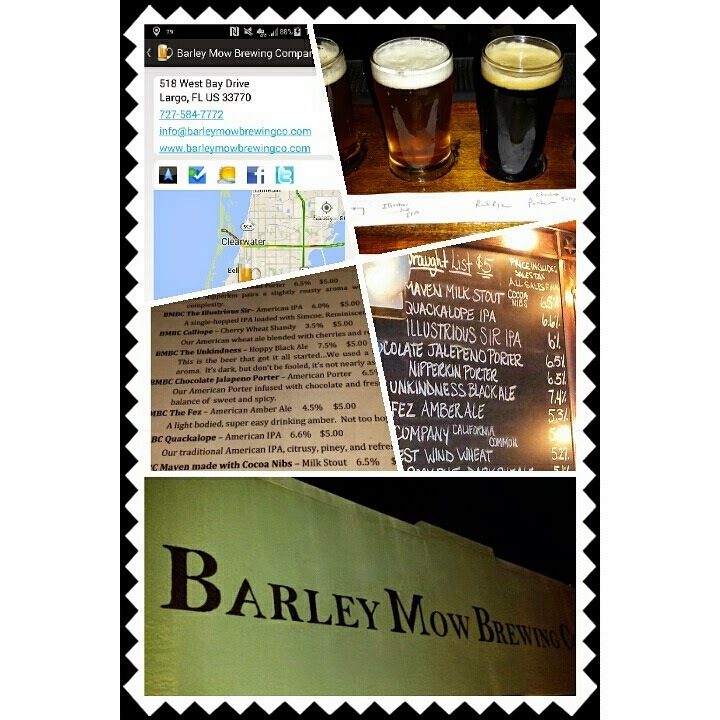 We were staying in Largo, and on our first trip to the beach passed Barley Mow Brewing Company, a relatively new brewery with a diverse portfolio. The Company California Common was an immediate favorite with its smooth flavor and subtle hops. The Illustrious Sir IPA is a lighter bodied IPA, but with a strong nose and fresh finish. Also try the Black Rock Rye with it's spicy malt, sweet aroma, smooth finish. Being a weakling I should have avoided the Chocolate Jalapeno Porter - no subtle jalapeno here - it's in your face. 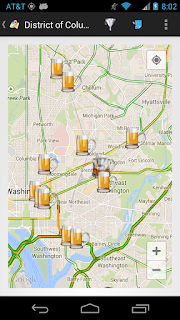 One of the more useful features of theCompass is it's Location search, where the application returns breweries within a predefined radius of the device. 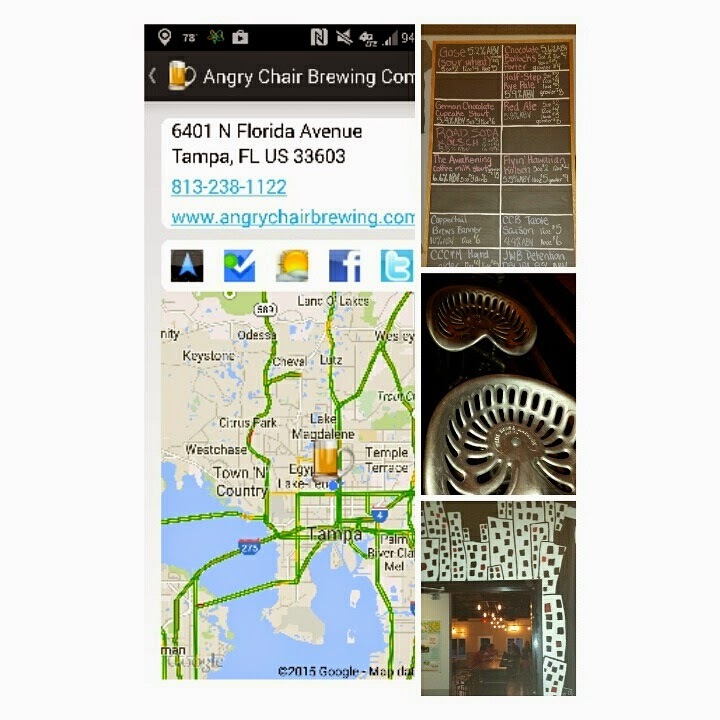 After a day at the Lowry Park Zoo, theCompass showed a brewery in the very near vicinity: the Angry Chair Brewing Company. Despite having a limited portfolio and being located off the beaten path, this gem is a mandatory visit. Their portfolio is currently small because they have a long term barrel aging plan - with sours in play. Fortunately one sour was available, their Gose - at this point my favorite #flbeer. Sour, refreshing, with just a hint of salt & coriander. Spot on. Their German Chocolate Cupcake Stout is worth a taste, subtle cake flavor with just a hint of sweetness. Surprisingly there are no breweries near Clearwater Beach, so after a visit to that town's aquarium, I drove the family ten miles north to Dunedin and 7venth Sun Brewery. I had targeted that brewery because of their love of brett and hit two out of the park with the Dancin' In The Street Berliner Weisse and the Hopeless Bromantic, a Brett Farmhouse brewed with Italian Plum. The later was fabulous, my favorite of the entire trip - just above the Angry Chair Gose and the Dancin' In The Street. Sadly the day had turned into night quickly and I couldn't convince my companions on a stop at Florida's oldest micro-brewery, the Dunedin Brewery. The final day before driving back North was a day trip to St. Petersburg. After watching dolphins play off The Pier, we took the trolley to the center of town where Cycle Brewing and the St. Pete Brewing Company share a common block. While the family ate at Acropolis Greek Taverna, I walked across the street to Cycle Brewing and quickly quaffed a pint of their most appealing beer - the Cycle Path - an Indian Pale Lager that had an IPA finish accompanied by a fresh lager flavor. 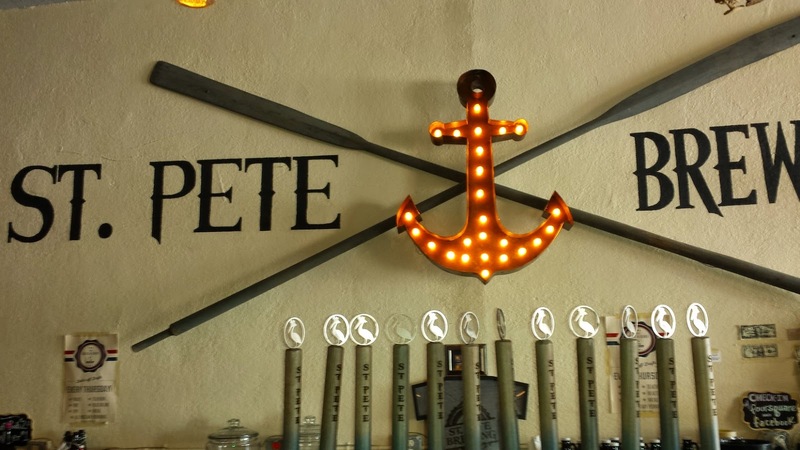 On the back side of the restaurant sits the St. Pete Brewing Company and with a short amount of time I sampled and returned home with their flagship St. Pete Orange Wheat. I've been enjoying this beer and its refreshing, crisp wheat flavor since returning home. I didn't get a chance to stop into St. Pete's 3 Daughters Brewing, but I've also been enjoying their Beach Blonde Ale as well. Florida will soon be known for more then their beaches and Disney. Their breweries are brewing refreshing beers to match their beach environment as well as push the boundaries to dark and funky beers. Cheers. 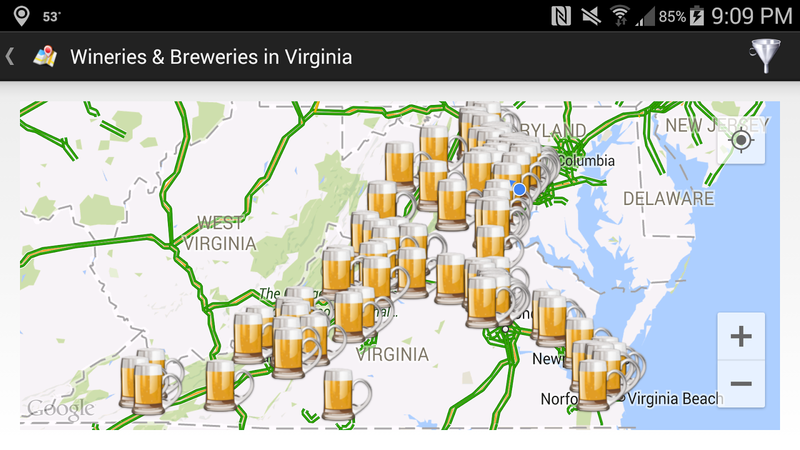 This Saturday we continued the #VABreweryChallenge with a visit to Purcellville in DC's Wine Country - Loudon County. 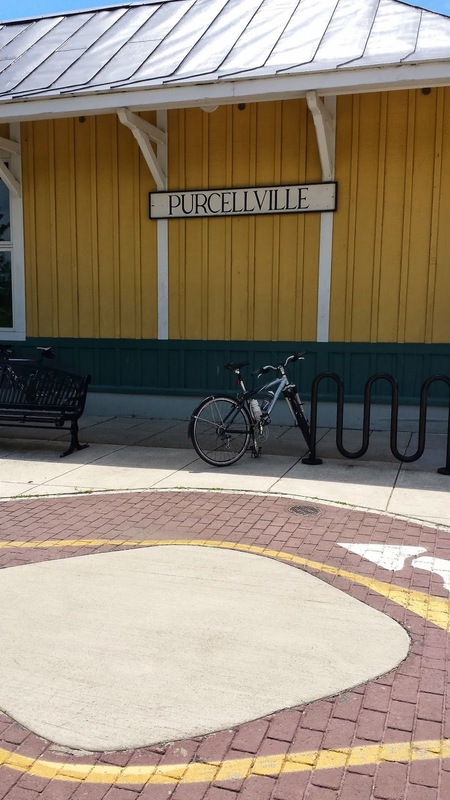 Known mostly to Northern Virginia's as the terminus of the W&OD Bike Trail, Purcellville has a growing beer and spirits community in addition to the area wineries. 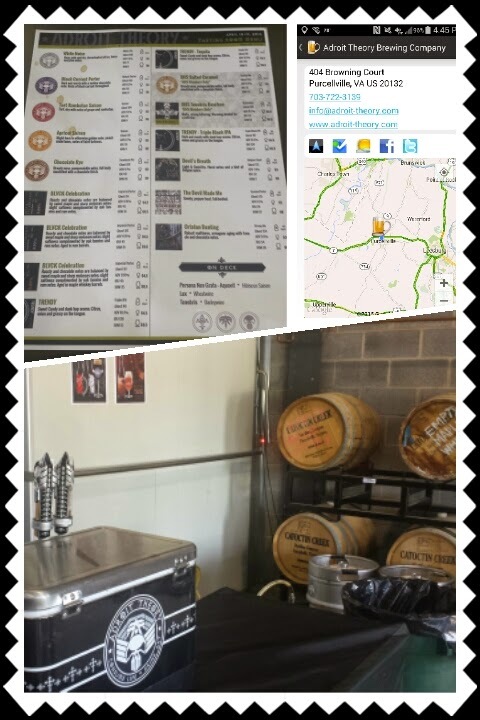 The new tasting room and cocktail center at Catoctin Creek Distilling Company is a must visit, but for our purposes, we spent time at the three local breweries: Corcoran Brewing Company (#10), Adroit Theory Brewing Company (#11), and Belly Love Brewing Company (#12). 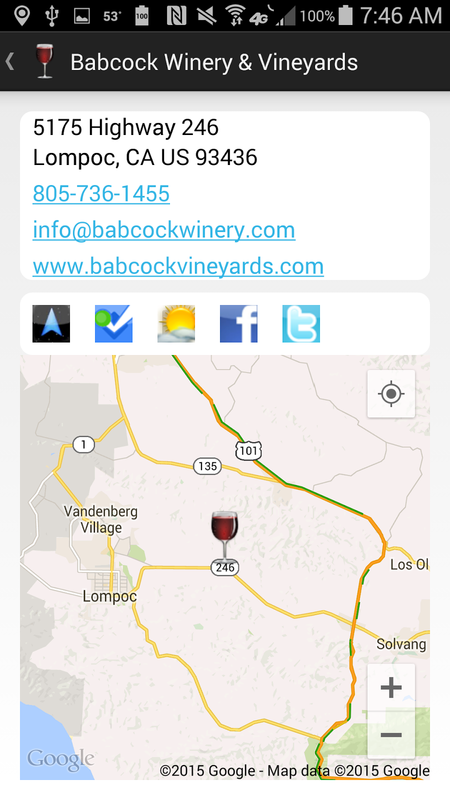 And all three are very accessible to the bike trail and easy to navigate to using theCompass Winery, Brewery, Distillery Locator app. 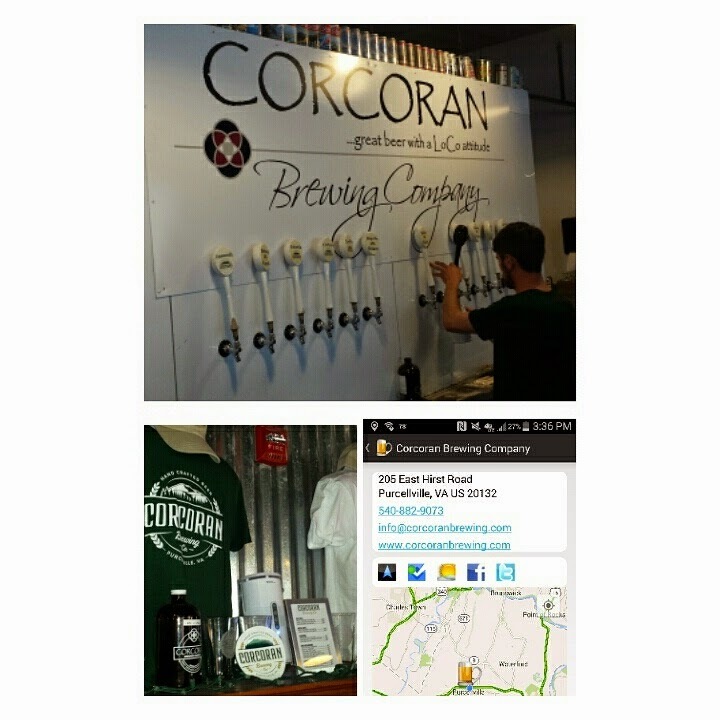 Corcoran Brewing Company is a vertex of the Corcoran wine, beer, and cider triangle. Once housed in a renovated barn at the winery location, the brewery moved to a more spacious site off Hirst Road. the brewery focuses on solid, easy drinking beers that seemed to have captivated a market as two full buses rolled in during our visit. The beer names commemorate the LoCo area and Corky's family history, and I've always found the beers clean and representative to the style. Today's samples were The Commonwealth Kolcsh and Dutchman's Creek Hefeweisen, both low ABVs and refreshing - a perfect suit for a warmer than usual spring day. 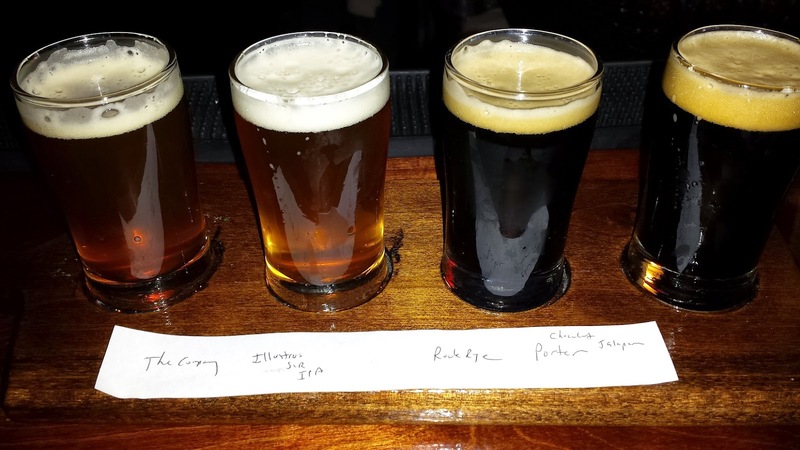 Adroit Theory Brewing Company is located a very short distance down Hirst from Corcoran. Besides proximity to each, any similarities with the two brewers end as this brewery specializes and high alcohol, funky, wood aged beers. The lowest abv beer weighed in at 7.8% with several over 10%. The most interesting beer this visit was the Trendy Triple IPA aged in used Tequila barrels. The barrels actually mellow the beer and provide a soft agave finish. The Chocolate Rye Farmhouse Ale was also tasty with its spicy chocolate character. But, my favorite was the Tart Rambuten Saison - hits the sweet spot in both dryness and tartness - and one I could drink all day, 8.8% abv permitting. 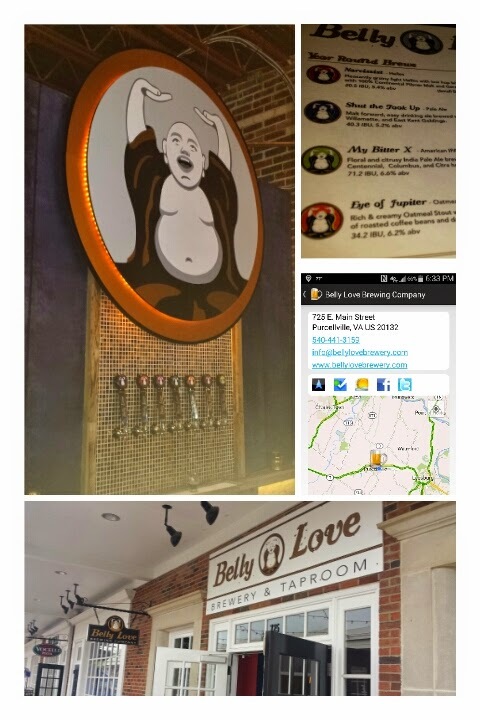 Our final stop was the newly opened Belly Love Brewing Company, located in a pedestrian area of a strip mall off Main Street. The first thing we noticed was a food menu and the soft pretzel and scotch eggs helped ease hunger pains. As for the beer, I stayed on the lighter side with the Narcissist Helles which I found to be bright, rich in flavor, and refreshing. We also had to try the Shut the Fook Up Pale Ale - with a nice balance between the malt and hops. And for a gluten free alternative try the Insatiable Bread Substitute (IBS) Cream Ale; I preferred the Narcissist but not too bad. Altogether, this is a relaxing environment and filled quickly as the dinner and nighttime crowd starting moving in. Italy's Veneto region is most known for its Soave wines; but their reds have been somewhat a mystery. My main exposure was a Protocol Wine Studio session last year focusing on the Valpolicella DOC. Fortunately, Leonardo LoCascio Selections has allowed me to revisit the region by sending me the 2012 Alanera Rosso Veronese IGT ($20, 13.5% abv). It is produced by the Zenato winery, which was founded in 1960 by Sergio and Carla Zenato and is a leading producer of Lugana, Valpolicella and Amarone wines. Like Amarone wine, the 2012 Alanera Rosso Veronese IGT is made using the local appassimento method in which 50% of the red grapes (predominately Corvina) are partially dried before fermenting. The process concentrates the fruit and provides earthier attributes, but doesn't sweeten the wine as I has expected. Besides Corvina, the blend for the Alanera also includes the native Rondinella, Corvinone, and smaller percentages of Merlot and Cabernet Sauvignon - with a portion of each variety partially dried using the appassimento method. 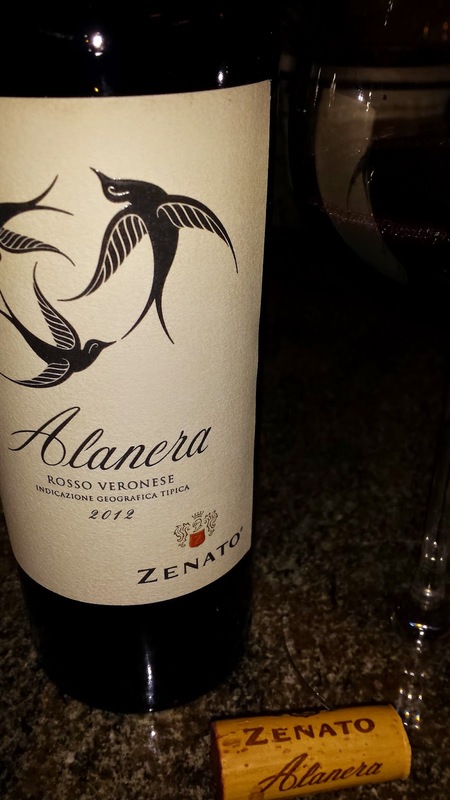 And the name Alanera is a tribute to the Corvina grape, raven in Italian, and thus Alanera or "black wing". The wine is extremely dark, another attribute of Corvina, and starts with sweet tobacco and leather on the nose. The flavor is similar to chewing on dried cherries - there's a velvety texture - with the wine finishing dry and tannic. After decanting, the tannins mellowed quite nicely and the dark cherry flavors deepened. A very nice and approachable wine. The 2015 Wine Bloggers Conference will be held August 13-16 in New York's Finger Lakes Wine region. This is the first time the conference is being held in an East Coast cold climate region, in particular, one that is both wet and cold. Historically a region noted for Concord and French hybrids, the Finger Lakes has expanded beyond these varieties because of modern viticulture techniques. Many of these techniques were first implemented by Dr. Konstantin Frank who introduced vinifera varieties into New York in the 1950’s. In his opinion, if "vinifera could be grown in Ukraine, then it could survive in New York". The main problem he theorized was the lack of a suitable rootstock, not the cold weather. He found that rootstock in Quebec and after a couple bountiful harvests founded the Vinifera Wine Cellars in 1962. Now known as Dr. Konstantin Frank Vinifera Wine Cellars, the winery has passed from Dr. Frank to his son Willy to his grandson, Frederick Frank. The latter explains the first two fundamental steps in grafting pioneered by the winery. "Our goal is to achieve a medium size vine throughout the vineyard. This is accomplished by using phylloxera resistant rootstock and matching the rootstock vigor to the soil type. Second, hilling up the graft union of the vine with about a foot of soil protects the graft union and basal buds from the cold. We uncover this soil mound every Spring." Even if the buds perish, the vines may survive due to the hilling of the graft union. The winery also aims to keep the vines free of fungus disease throughout the growing season because a vine weakened by fungus disease would be more susceptible to winter injury. By starting with these techniques, the Frank family along with the hundred other wineries in the region have proved that vinifera can survive and excel in the Finger Lakes. This winter was a good winter for us principally because it got below freezing in early December and stayed below freezing until a few days ago. So we are looking at 25% bud damage which for us is normal and we prune to compensate for it. Last year it got cold than warmed up to above freezing for a few days in early January and then dropped to below 0 in 24 hours. That happened at least 4 times over the next two months. It turns out each time it gets above freezing and then gets cold again the vines loose some of their cold hardiness and becomes less tolerant to cold each time that happens. A vine can adjust when there is gradual cooling but when you have extreme drops in temps then we experience lots more damage. The Finger Lakes microclimates assist in alleviating these cold weather casualties, particularly among the four longest lakes: Seneca, Cayuga, Canandaigua, and Keuka. Bruce Murray, owner of Boundary Breaks Vineyard, explained to me how the Finger Lakes are some of the deepest in America, with Seneca Lake dropping to over 700 feet. Thus the lakes never freeze and actually warm the prevailing NW winds. This helps to increase temperatures around the lakes by 2-3 degrees in which Murray says, "this slight increase allows grapes to ripen sufficiently during our short growing season". John Martini of Anthony Road Wine Company believes their proximity to Seneca Lake has provided some protection from frost (as well as hilling each fall). And both Frederick Frank and Scott Osborn noted that they plant more tender varieties in the mildest microclimates in the Finger Lakes, with Frank emphasizing the east side of Seneca Lake. Osborn continued that he then plants more cold hardy varieties like Riesling, Cabernet Franc, Lemberger, and Cabernet Sauvignon further away and at higher elevations. The founders of Standing Stone Vineyards were the first modern day entrepreneurs to research specific vineyard sites in the Finger Lakes. According to current owner Martha Macinski,"... in the 1960s Charles Fournier and Guy DeVeaux (Gold Seal Vineyards) learned about Dr. Frank’s efforts to plant vinifera in the Finger Lakes, and saw for themselves the variation in microclimates throughout the region. For three years they collected data and made observations on 100 test sites throughout the Finger Lakes, primarily on Seneca, Cayuga and Keuka lakes. In 1969 they purchased what is now Standing Stone Vineyards from Mr. Bedient, for $1,000 per acre, which was a sign of how much they wanted it. That was a hefty sum for vineyard property in those days". Where did Fournier and DeVeaux select their property? The east side of Seneca Lake. Each winery has also establish specific steps for pruning, canopy coverage, and yields to assist the vines surviving the winter. Frederick Frank mentioned that their winery insures that crop levels are moderate and not excessive, which could weaken the vine and result in greater winter injury. Murray mentioned that Boundary Breaks manages crop size (the ideal yield is 3.5-4 tons per acre) by dropping grapes just before Véraison. However, he noted that dropping too soon will give the cluster too much vigor, increasing the berry size which dilutes the juice if the grape doesn't split in the summer. Osborn starts pruning in late December with the most winter hardy varieties first the leaving the least hardy to late March. And Macinski says that Standing Stone uses a Vertical Shoot positioning trellis system which they believe contributes to minimal winter damage since the trunks are shorter, thus less area to split. As for the vinifera varieties grown in the Finger Lakes, Murray stressed the region's similarity to Alsace and Western Germany - thus Riesling is King, with smaller plantings of Chardonnay, Gewurztraminer, and the Pinot grapes. Bordeaux is prevalent - notably through Cabernet Franc. But there are also increased plantings of unique varieties such as Gruner Veltliner, Lemberger, Dr. Frank's Rkatsiteli, and Standing Stone's Saperavi.There will be plenty of diversity for #WBC15 attendees. In closing, I'll leave it to Frederick Frank to summarize viticulture in the Finger Lakes: "shoot for a healthy medium sized vine in a favorable site in the Finger Lakes with good air drainage and a sloped contour with drained soils and close to a deep lake. This will give us the best success in growing vinifera in the Finger Lakes". Cheers to that and looking forward to the 2015 Wine Bloggers Conference. And thanks to Frederick Frank, Scott Osborn, John Martini, Bruce Murray, and Marti Macinski for taking time to correspond. 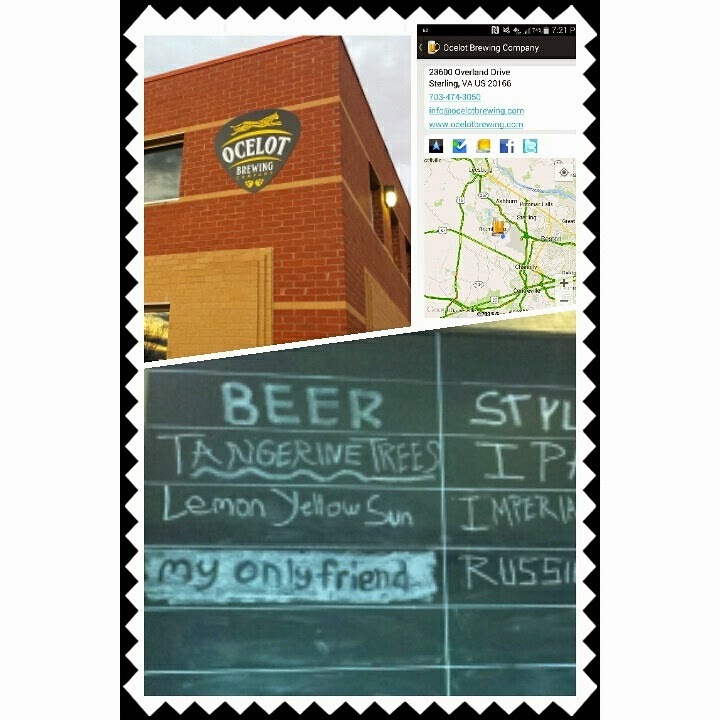 Friday night we continued our #VABreweryChallenge by visiting newly opened Ocelot Brewing Company located in Sterling Virginia not far from Dulles Airport. They are located in a rather expansive warehouse with a large supply of fermentation and aging tanks already installed. Currently the brewery has three beers available with many more in the queue - particular I hear a lactos laced sour. Whereas these three available beers were tasty, only one seemed to match the style - the Tangerine Trees IPA. The My Only Friend Russian Imperial Stout was quite bitter and hoppy to be labeled as such and the Lemon Yellow Sun Wheat was more IPA than wheat. However, this was my favorite beer. Made from 50% white wheat it had a clean refreshing citrus flavor and a clean hoppy finish with a hint of sweetness. Not a wheat beer but a fine pale ale. Good luck to Ocelot, cheers, and safe travels. For those cyclists who live or are visiting Florida's Suncoast near Tampa, the Fred Marquis Pinellas Trail is worth a ride in order to visit the many breweries along the trail. The trail measures 38 miles between Tarpon Springs and St. Petersburg along abandoned rail lines. 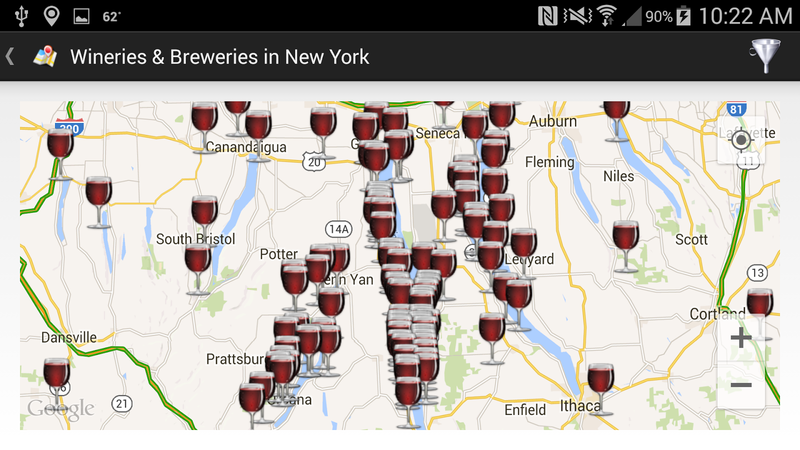 And throughout it's length, theCompass Winery Brewery Distillery app shows several appropriate rest stops. 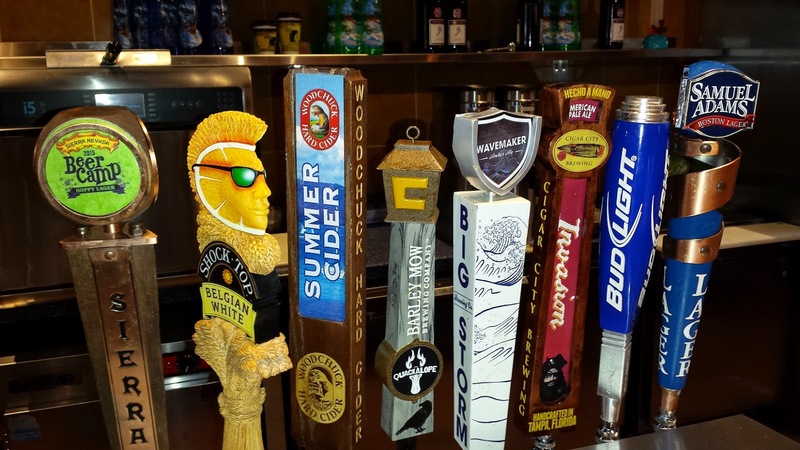 From the north you will want to start or end your ride in Tarpon Springs with some Belgium styled ales from Saint Somewhere Brewing which is due west off the Elfers Spur. 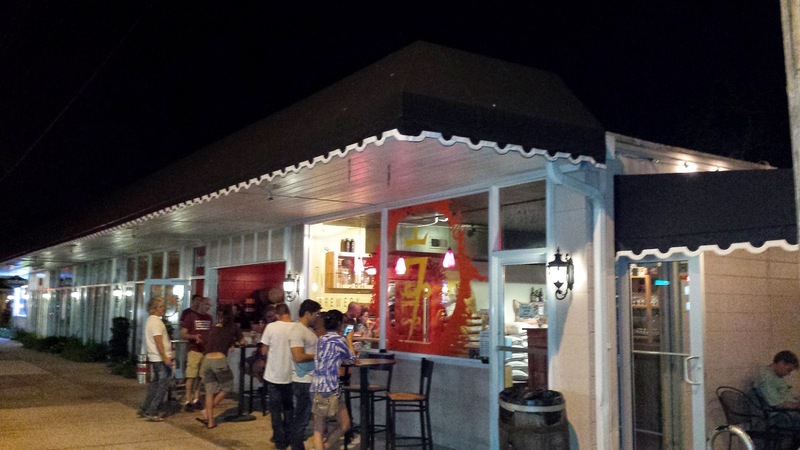 Closer to the trail in downtown Tarpon Springs the newly opened Silverking Brewing Company and Tarpon Springs Castle Winery are waiting. Then head 11 miles south to Dunedin, home to Florida's first craft brewery, Dunedin Brewery, as well as brett specialists 7venth Sun Brewery. And on Friday evenings, Cotherman Distilling opens their doors for some spirits tasting. 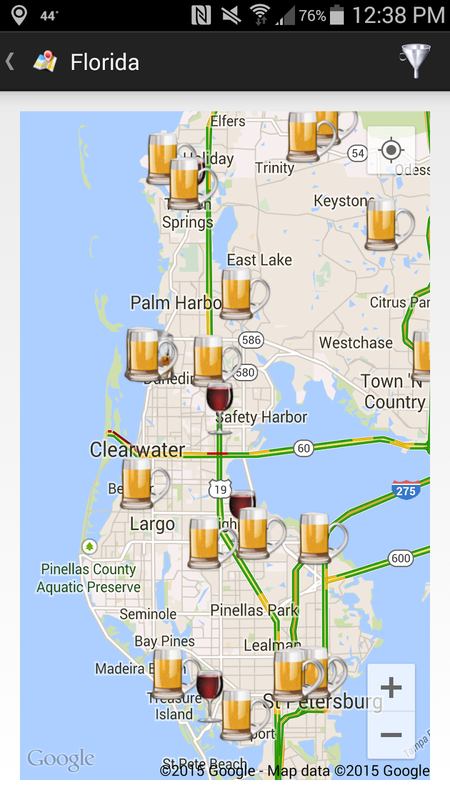 Clearwater is the next major town heading south, but unfortunately any breweries are further east, so continue until you reach Largo and head less than .5 miles east of the trail on West Bay Drive to Barley Mow Brewing Company. This stop is highly recommended. 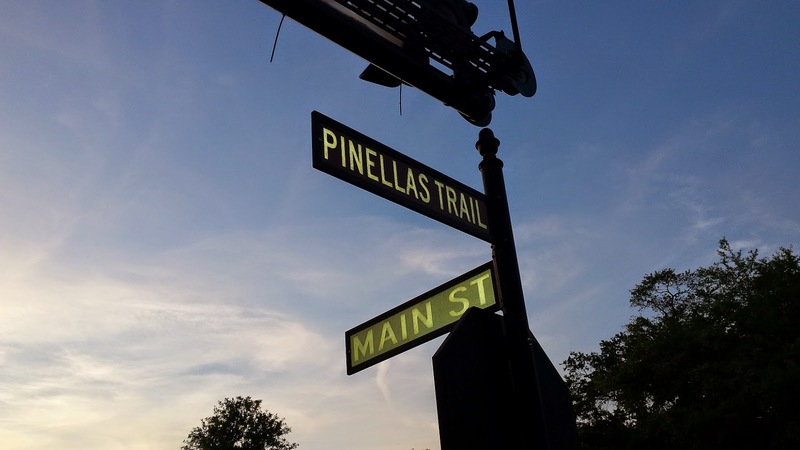 The trail bottoms out in South Pasadina and Gulf Port where you can take short side trips to the Florida Orange Groves and Winery on Pasadena Avenue South or Peg's Cantina and Brewpub on Beach Blvd - the birthplace of Cycle Brewing. The trail officially ends in downtown St. Petersburg, although it connects with the Pinellas Community Trail for a few additional miles. 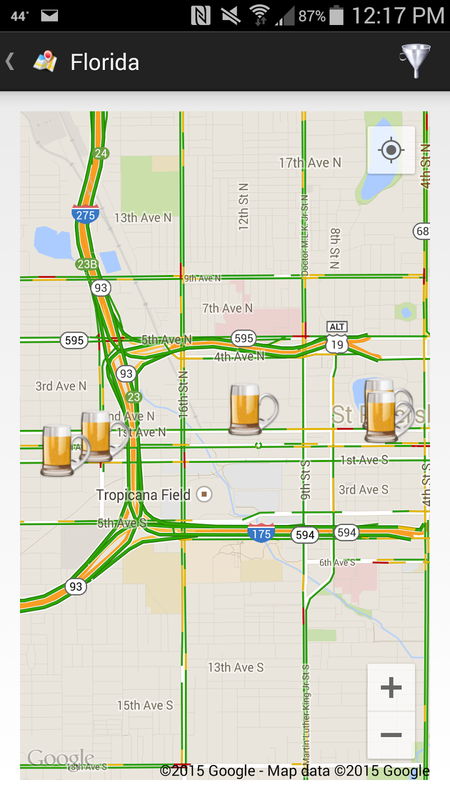 Start your St. Petersburg beer tour by heading north on 22nd Street to 3 Daughters Brewing. Continue a couple blocks on 2nd Avenue east, then 1 block north on 2oth Street to the soon to be opened Pinellas Ale Works. Pick up the trail again at 2nd Avenue and just after Tropicana Field turn left at 11th Street. Two blocks later you will see Green Bench Brewing Co. on Baum Avenue. 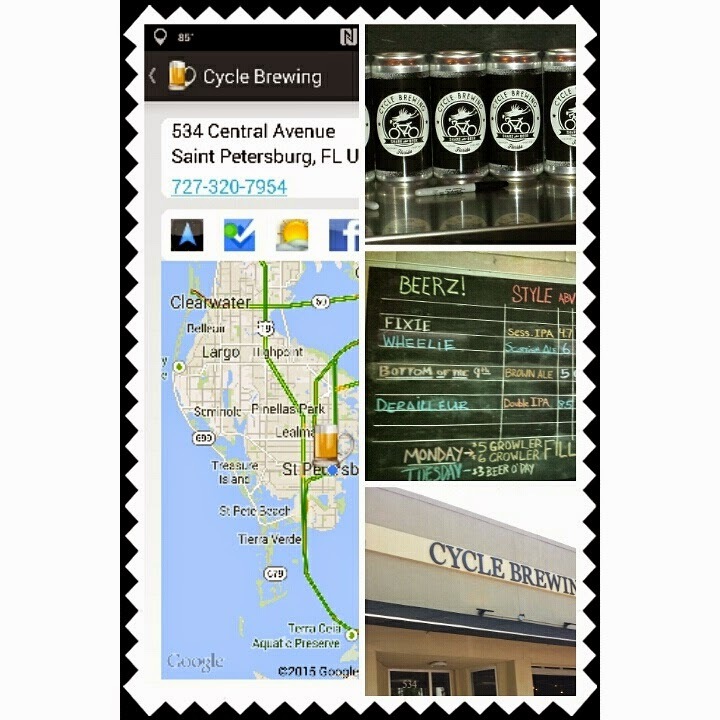 Then head east on 1st or Central Avenues until you hit the St. Pete Brewing Company or Cycle Brewing - both a block away from each other. Both have ample space to stretch your muscles and relax with a good craft beer. 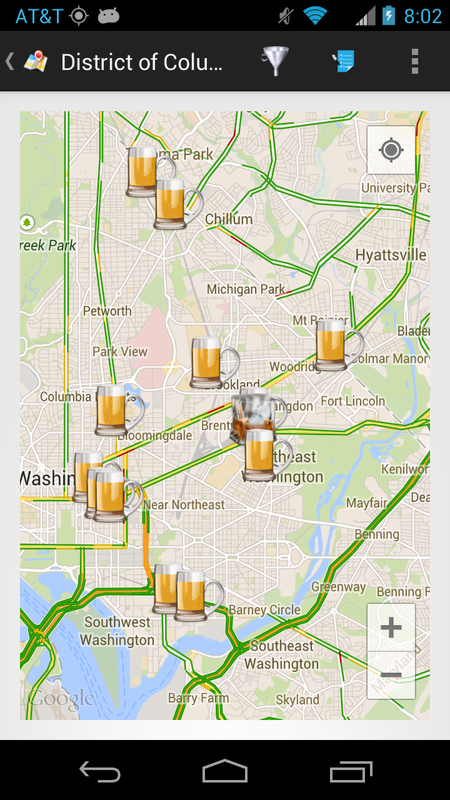 Cheers and safe riding. Late last month the Santa Barbara Vintners Association organized a twitter tasting focusing on the region's Cabernet Sauvignon producers. 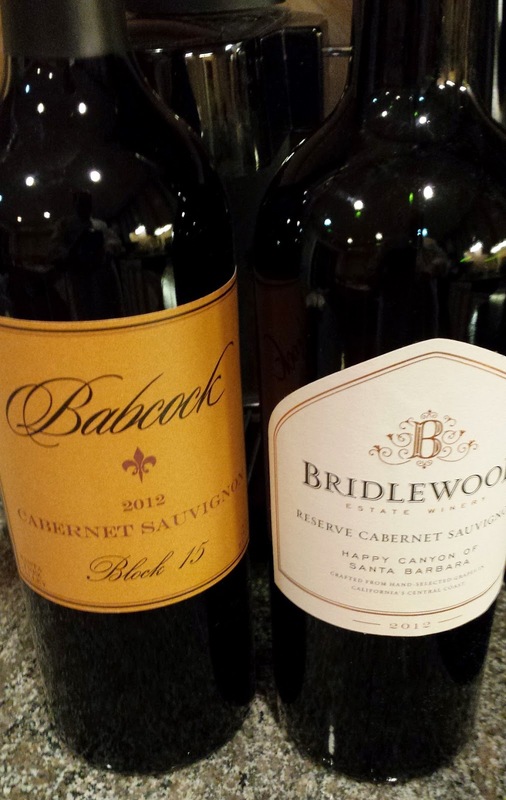 I was fortunate enough to participate and received two wines, the Bridlewood Estate Winery 2012 Reserve Cabernet Sauvignon Happy Canyon and the Babcock Winery & Vineyards 2012 Block 15, Cabernet Sauvignon Estelle Vineyard, Santa Ynez Valley ($35). Most of the wines were from grapes grown in the new Happy Valley AVA (created in 2009) which resides to the far east of Santa Barbara County. 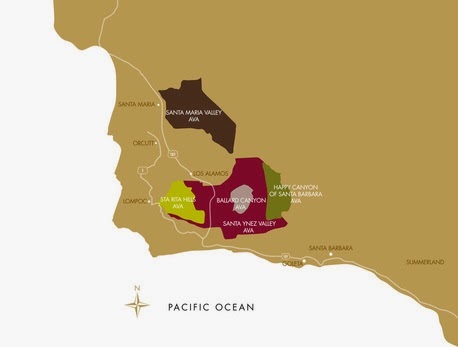 The Santa Ynez Valley AVA is adjacent bordering the west and shares many of the characteristics conducive to growing Cabernet Sauvignon and other Bordeaux grapes. The primary reasons are the long, dry growing season with large diurnal shifts from day to night. Foxen Winery and Vineyard mentioned that the diurnal shifts are higher in the valley sense the cold fog drifts down cooling the valley even more. Another trait to the region is the sandy soil which provides excellent drainage as well as allow the vines to be own rooted. The wineries believe that own-rooted vines provide more structure and tannins. And the two wines I sampled had plenty of structure, tannins, and tasty juice. The Bridlewood Estate 2012 Reserve Cabernet Sauvignon Happy Canyon started with a hot cherry aroma, transitioned to spice and leather that synced the middle, and finished with chewy tannins. Very chewy tannins. The Babcock 2012 Block 15, Cabernet Sauvignon Estelle Vineyard was juicier with jammy dark fruits (plum and dark cherry) noticeable throughout with a velvety core and easy tannins on tail. An excellent wine. Looking forward to my next visit to Santa Barbara. Cheers. Yesterday I watched the final spring training game at George M. Steinbrenner Field between the Yankees and the Nationals and was underwhelmed with the craft beer options. When walking into the stadium I saw a Craft Beer sign above one booth which sold Miller Lite and Yuengling. Another beer station carried Magic Hat #9 and another Abita Purple Haze; two interesting choices. 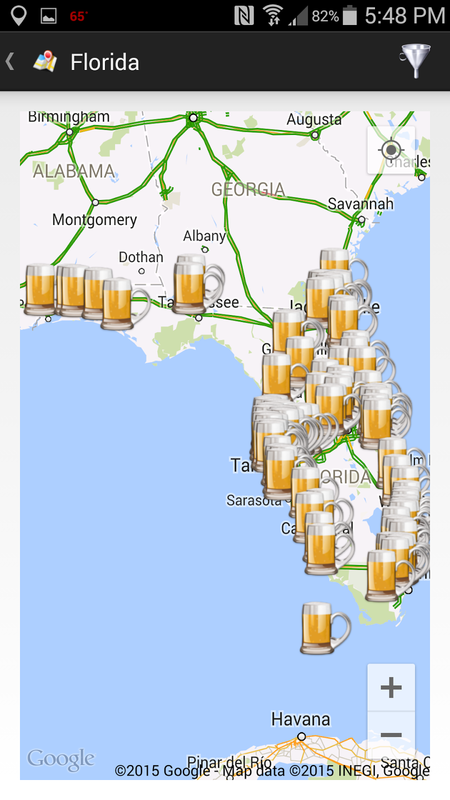 The only Florida beer I stumbled upon was the Florida Avenue Brewing Co IPA. Pleasant, but was expecting more Florida options, not even Cigar City Brewing. During our Spring Break trip to Tampa, my son planned the week around visiting his favorite thing - wildlife and thus visits to Lowry Park and Busch Gardens. The CityPass is highly recommended to cut costs and both parks have abundant animals; but not so much craft beer at Lowry Park. Couldn't find anything. 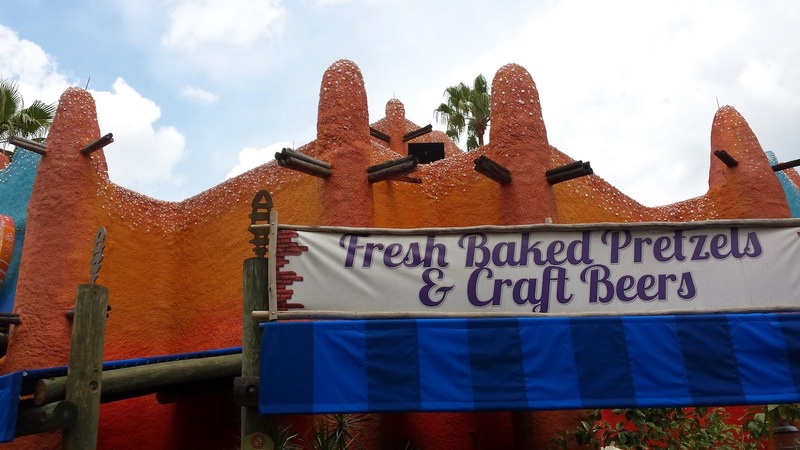 On the other hand Busch Gardens makes the crowd more tolerable by offering Florida craft beer in several locations. 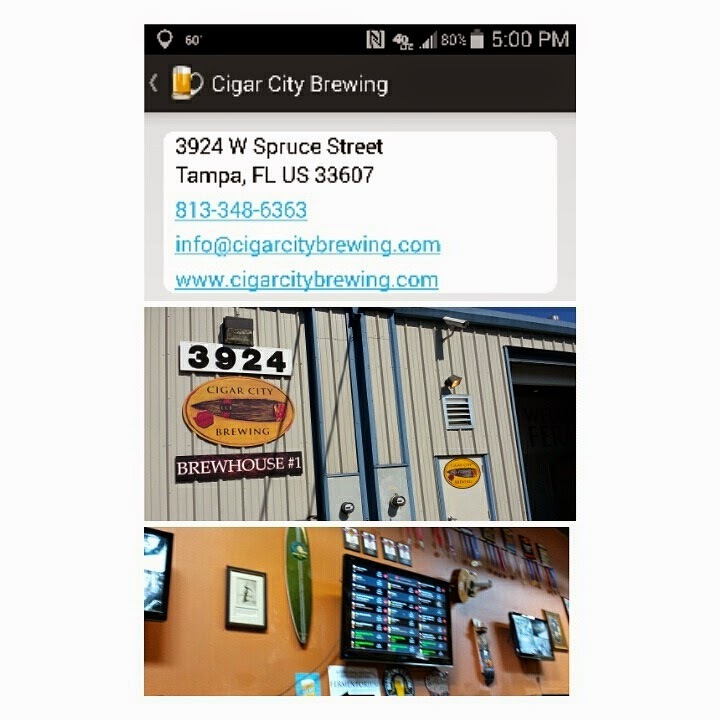 I noticed the Cigar City Florida Cracker at several outside food kiosks, although your lunch or dinner bill increases by $8 a beer. But your best option is the Craft Beer House in Pantopia where Florida breweries were represented by Barley Mow Brewing Company, Big Storm Brewery, and Cigar City Brewing. Plus a Beer Camp brew from Sierra Nevada Brewing Company or a Sam Adams and you should be set. Cheers.